The adult’s role in children’s journey is to support and facilitate their growth and development. To assume this role, to teach young children, is a great privilege and responsibility. Teaching is a mission - a valued and time-honored Jewish tradition. We look for teachers who are passionate and will offer a nurturing experience for the children. 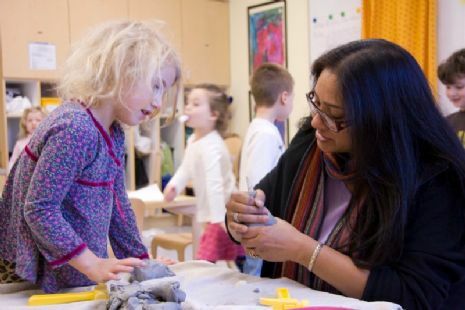 Our teachers have a deep understanding of children and the way they think, and have the desire to create meaningful relationships with the children. All our teachers believe in the importance of seeing each child as an individual. Our teachers plan and adapt the curriculum and the environment to meet the needs of each child. According to the Reggio Emilia approach, the teacher sees herself as a learner – alongside the children - open to new thoughts and ideas. The teacher listens carefully to the children, observes and documents their work, and provokes and stimulates their thinking. As teachers, we are committed to strengthening and enriching our knowledge of young children by continuing our own education. Early Childhood has always been my passion. I have a Masters Degree in Education, have been involved in Education for 20 years and am pleased to be returning for my 13th year at Chai. I’ve always been drawn to the little ones and their wonder and excitement for the world around them. I spent many years teaching preschoolers and for the past seven years have directed the Chai Jewish Preschool. Together with the wonderful families and children, we have created a school where each child is cherished and loved. I look forward to another wonderful year together as we watch our children grow and flourish. Hello, name is Erika. I have worked in administration for the past 15 years. Inspired by Chai, I’m currently in the process of attaining my credentials in early childhood development. I have decided to make early learning my life’s work because I believe that a child’s education is the most valuable thing in the world. Knowledge is power and I recognize that the earlier it begins, the better for the child. This is my first year at Chai preschool and I’m looking forward to meeting all of the children and their families. My name is Rhonda Gamblin and I am so happy to be returning for my 7th year as a part of the teaching team here at Chai Preschool. My first experience with preschool was with my mother who was a preschool teacher. She would allow me to go to work with her and I could see firsthand the amazing work she did at school and how much the children loved her. I was inspired by her dedication to become a preschool teacher. I have been a teacher, Asst. Director, and a Director, and I am still so excited about the development of children. I have been teaching for over 20 years and I have taught ages 18 months to 5 years. I really look forward to teaching in the Toddler class. This is such a critical time in a child’s life and I am more than happy to be a small part of all the wonderful changes that will take place. My hope is to form a partnership with the families, develop a relationship with each individual child, and provide long, loving memories that will extend into the lives of each child. So, let’s have a wonderful, fun-filled, exciting, exploratory year! My name is Mushkie Weese and I am honored to be apart of the incredible Chai team this year. Education has always been a passion of mine and I'm so impressed with the philosophy of Chai that really encourages children to reach their potential in a warm, nurturing environment. I am really excited to be joining the Chai family and getting to know you all. I'm looking forward to an incredible year! I am very excited to be starting my third year at Chai Preschool! I have been teaching children for six years. I’ve taught children between the ages of 18 months to 5 years of age in preschools in New York and Toronto. I received my teaching certificate from Beit Chana in Tzfat. I love being with children: observing, interacting and playing with them. I’m inspired by the way that young children are intrigued and filled with wonder by the everyday world. They are incredible little people who have the potential to change the world, and my hope is to help nurture within them the confidence, skills and compassion to do so. I am looking forward to a wonderful year with the children of learning, discovery and growth. I am very excited to be beginning my 10th year at Chai! I have a bachelor’s degree in Art and I taught art both here and in Israel. Then I discovered early childhood education and I fell in love. I adore spending time with the children, watching them discover the world around them. I enrolled in Early Childhood Education courses, and am now a qualified preschool teacher. I am looking forward to spending another year with your wonderful children. My name is Akemi Hamada, and this will be my first year at Chai Preschool! I love working with children and have been nannying and teaching children for five years. I’m currently pursuing a degree in early childhood education because I feel that these early years in a childs life are so important. I believe in providing each child with the utmost care and respect, and through fostering and supporting each one they are able to open up to their unlimited potential. I am so excited to learn and grow with the students in such a positive encouraging environment! Hello everybody, I am Kanti Krishnan. I just started working here in July. I have a background in Journalism and graphic design and visual communication. I have always had good connection with children and I switched my career to Early Childhood Education and it has been absolute bliss working with children. I'm currently enrolled in an Early Childhood Certification program iat the UCSC extension. I’m looking forward to working with all the children and families at Chai preschool. I feel so fortunate to work with children and families and I love being part of the preschool experience. I considered obtaining an elementary credential, but fell in love with early childhood education and never looked back. I have worked in early childhood education for 24 years. This will be my 11th school year at Chai! I am happy to be part of this unique and wonderful school. My first 2 years at Chai I served as Lead Teacher in the Toddler class. Seven years ago I moved over to work in the administrative side of the school as Co-Director. I am excited to go 'back to my roots' and teach in the Pre-K class this year. I hold a B.A. degree in Child Development and a Program Director Permit from the California Commission on Teacher Credentialing. I'm looking forward to a fun year of learning! My name is Evelyn Mira. I have been teaching toddlers and preschoolers for 11 years. I have an associate teaching permit and am continuing my education to achieve my AA degree in early education. I love working with children and watching them grow and learn. I look forward to my 7th year at Chai Preschool and meeting the children and families. Hi, my name is Perel and I come all the way up from Australia! I have heard about the amazing staff and program that Chai has to offer. I feel very honored and excited to be a part of it. I have experience with teaching in Hebrew school and summer camps. I am very passionate about education and hoping to learn as much as I give! I feel privileged to have this opportunity to teach the next generation. Looking for to getting to know all of you. I’m excited to be joining Chai’s staff. A few months ago I began working in Chai’s office to help support Esty and Helen. I found myself visiting the classrooms and enjoyed it so much that I enrolled in Early Childhood Education courses. I am looking forward to teaching with Marion in the afternoons and subbing in the mornings. Greetings, my name is Marion van Heteren. I have been a teacher at Chai for the last four years, and I’m excited to continue with Chai. Previous to coming to Chai, I spent 5 years as a substitute and associate teacher in several schools in Palo Alto and Portola Valley. I took my Early Childhood classes at Canada College. I also have a BS in History from Humboldt State University. I am certified as a Master Gardener in San Mateo and San Francisco counties, having completed the program last year. I love to bring gardening to Chai! I have two grown children. I live in Foster City with my husband and three dogs. My name is Yoshiko Oehlerking. This will be my fourth year at Chai Preschool and I am very excited! I have completed my ECE units and have 3 years of preschool teaching experience. I enjoy working with children. I believe every child possesses the highest potential within them and, as a teacher, I want to support and help them to unlock their possibilities. They always amaze me with their natural ability and I learn so much from them. I’d like to grow as a teacher together with children. I was born and raised in Tokyo, Japan and moved to the US almost 20 years ago. I am the mother of three children who helped inspire me to become a preschool teacher. I am looking forward to meeting you and your child here at Chai Preschool! It has been a pleasure working at Chai Preschool as a substitute teacher for the past three years. I taught Pre-kindergarten many years ago before I had my first child and have enjoyed getting back to teaching. I have three children, my youngest having gone to Chai for her three years of preschool. Getting to know the teachers, as a teacher, has been inspiring and it is such a supportive school. I will be continuing to serve as a substitute in all the classes, as needed. Working with the children and learning from them keeps teaching exciting and new. Chai Preschool is such a caring place and I am looking forward to another year working here.